Set the mood at your next Halloween party with our JELL-O® JIGGLERS Spooky Spider Recipe. 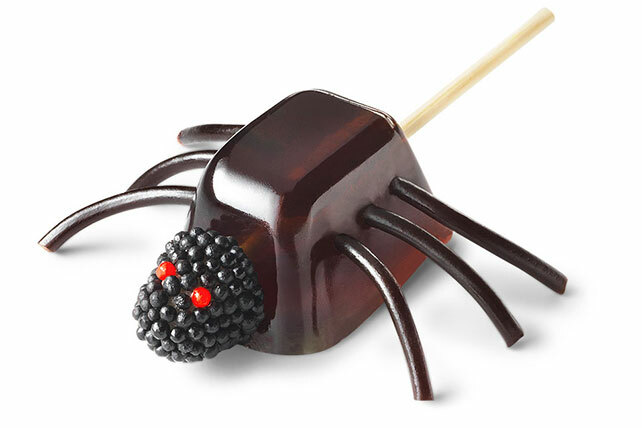 Not only is our JELL-O® JIGGLERS Spooky Spider Recipe adorable, the spiders have handles for even extra fun! Imagine the look on Dad's face when he finds a yummy spider on his shoulder. Spray 16 sections of plastic ice cube trays with cooking spray. Add boiling water to combined gelatin mixes in medium bowl; stir 2 min. until completely dissolved. (Do not add cold water.) Pour into prepared ice cube trays. Prepare JIGGLERS in 16 mini muffin pan cups instead of the ice cube tray. Substitute small black gum drops for the blackberries. Add 1/3 cup boiling water to remaining lime gelatin mix in medium bowl; stir 2 min. until completely dissolved. Stir in 1 can (5 oz.) evaporated milk. Pour into 2 dessert dishes. Makes 2 servings.